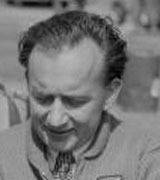 Eric Brandon took part in five grand prix in 1952 and 1954 without any real success, but it was away from Formula One that he made his name as a major player in the establishment of the Cooper Car Company. With childhood friend John Cooper, immediately after World War Two he built two cars. He was able to use his day job, in the family electrical firm, to source scarce parts. In 1947, driving a Cooper, he won Britain's first circuit race for 500cc cars, and in 1951 the first Formula 3 title. He formed the Ecurie Richmond team with Alan Brown, and in 1955 he funded the construction of his own Halsaylec sports cars, named after his electrical spares company. He raced regularly until 1956 when he switched his interest to hydroplane racing.